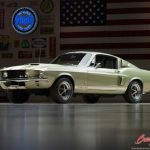 The last several years Saleen has showed off a new car or features, debuting their S281 Mustang in 2009 and a an S302 Mustang with custom colors and carbon fiber parts in 2010. This year the company has brought a new offering again in the form of the S302 Speedster. This is the first time we’ve seen Saleen show the Speedster look with the current Mustang platform, a $1,500 option for S302 models, and we have to say it looks pretty good. The car also features a few new features from Saleen as well, including the carbon fiber rocker panels and the matte black paint, which is one of their custom colors. If customers don’t want the subtle look, they can also choose from Igniter Orange, Octane Red, Silver Shield and Motor City Blue. Finally, the S302 Speedster also features the carbon fiber chin splitter and carbon fiber rear wing that debuted last year as well as painted 7-spoke wheels. You can see photos of the Saleen S302 Speedster in the gallery below. 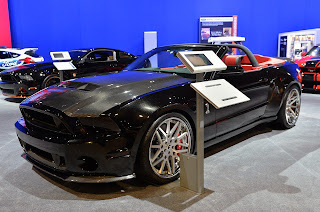 This entry was written by by MustangsDaily (Mustangs Daily) and posted here on Tuesday, November 1st, 2011 at 2:25 pm and is filed under matte black, News, saleen, saleen s302, saleen s302 mustang, saleen s302 speedster, saleen speedster, sema 2011. This article was not written by us, rather gathered using RSS feeds listed here. We take no credit for this article. You can leave a response, or trackback from your own site.